9-1-1 Dispatchers and Telecommunicators are faced daily with the difficult task of communicating with monolingual Spanish speakers over the phone. It is hard enough to communicate during a crisis in English. SpanishOnPatrol understands this problem and has designed its Spanish for 9-1-1 Dispatch course to meet the rigorous demands of 9-1-1 dispatchers and telecommunicators. SpanishOnPatrol's high-quality and up-to-date Spanish for 9-1-1 Dispatch training provides the exact Spanish language needed by dispatchers. 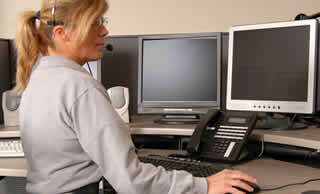 SpanishOnPatrol is a complete language training solution for all dispatchers. Spanish for 9-1-1 Dispatch covers Spanish spoken in Mexico, Central and South America, as well as Spanglish (combination of Spanish and English) and threatening language. NOW. Start anytime. Simply enroll online and you can start your seminar immediately. Everything you need is available online at LanguageAuthority.com. You can even print lessons to study off-line and create your own resource book. You can finish the course in a few days or take the entire term to complete. You receive unlimited access to all course materials for the entire course term. No restrictions. Score 70% or higher on all tests plus complete the required hours. But, don't worry. You can re-take a test anytime; we only keep the highest score. LanguageAuthority instructors are available via email. Any questions will be quickly answered by our teaching staff. Every module includes a culture awareness tip to help you understand differences between the cultures. LanguageAuthority.com is a web-based internet course with no software to install or download. Speakers or headphones are recommended.